I moonlight as a photographer and have shot everything from portraits and weddings to sporting events. I prefer full-frame DSLR cameras and the accompanying glass that goes with them for all my shoots. However, carrying that much equipment can make you feel like you’re carrying Sisyphus’ rock at the end of a long photography session. 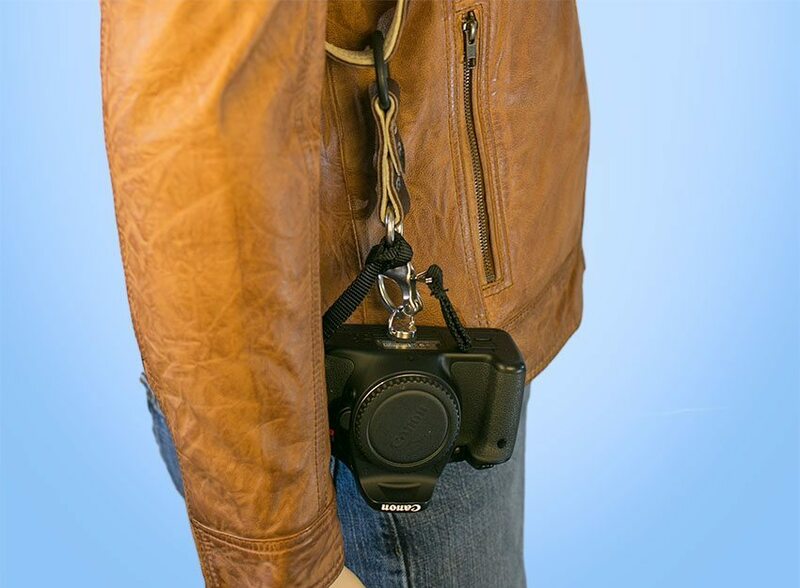 When I was offered the chance to review Hold Fast Gear’s Money Maker Luxury Leather Multi-Camera Strap, I took it without hesitation. The company claims it will allow you to carry up to 3 cameras comfortably for long periods of time. While I couldn’t justify the purchase of a third camera to my boss (read “wife”) for this review, I have plenty of glass to give it a thorough test. Matthew Swaggart founded Holdfast Gear in 2011 with three values in mind: taste, logic, and faith. As a photographer who has traveled the world, Matt understood the burden of carrying around pounds of equipment for hours or days at a time. With an appreciation for the design aesthetics of the past and the need for functional equipment that would hold up even under the most austere conditions, he founded Hold Fast Gear. His company offers a growing line of products designed to suit the needs of the on-the-go photographer. Today, Matt keeps his notebooks close with ideas for new products, and plans to launch at least 10 new products within the next year. He takes pride in the ethical production of all of his products in the USA while providing sustainable jobs to the Oklahoma economy. American Bison Leather (Mahogany): The genuine bison leather on this strap came from Colorado. Measurements average 35.8 mm across and 5 mm thick. Half of the thickness is due to the cream glove leather lining on the inside of the strap. There are four black D-rings on the front of the strap designed for carrying accessories. The two large buckles on the back allow for adjustment of the shoulder opening, having 9 adjustment holes spaced 25 mm apart. Dark grey punch-through rivets hold everything together including the leather securing the D-rings, the buckle straps, the cross piece, and the camera sliders. The camera sliders are constructed of a massive D-ring, an equally massive, nickel-plated swivel, a fold-over leather strap secured by 4 rivets, and ¼” screw mount to attach to the tripod mount on your camera. As if that wasn’t enough, they also added a safety catch made of nylon and a plastic swivel that mounts to the lug on the left side of your camera. Overall weight comes in at 1 pound, 14 ounces (840 grams), making it a little heavier than the bridle leather strap. 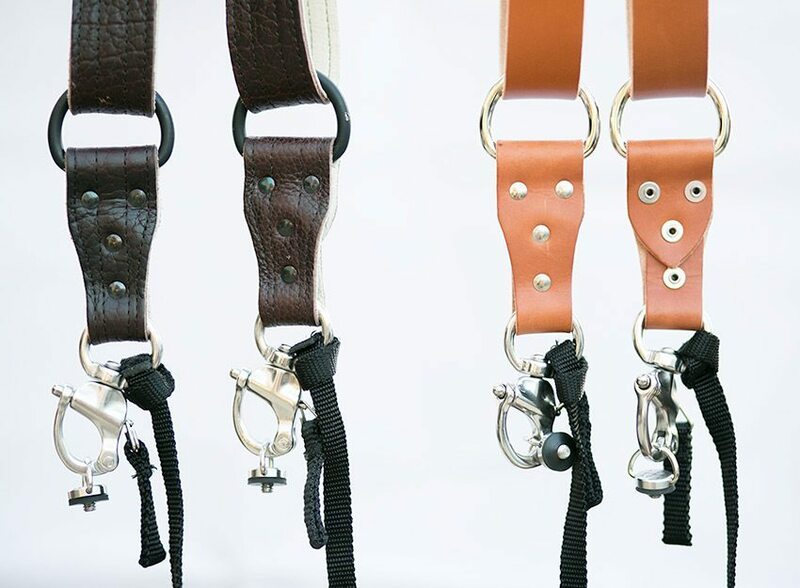 Tan Bridle Leather: We mention here only the differences between the straps. This strap measures 33.5 mm across (-2.3 mm) with a thickness of 3.2 mm (-1.8 mm). Of note, this strap is not lined with the cream glove leather. The hardware is all nickel-plated rather than black, including the rivets. 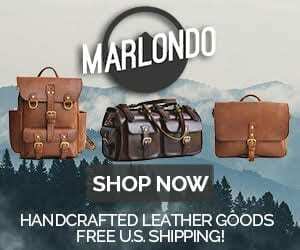 Overall weight comes in at a lighter 1 pound, 9 ounces (700 grams), and beside the bridle leather being naturally a bit stiff when it is new, those are the major differences in construction of the two straps. Because the overall design of the straps is nearly identical, I spent the majority of my time testing the functionality on the American bison strap. My first chance to give the strap a real test was at a wedding reception photoshoot. I attached my primary camera – a Canon 5D Mark III with battery grip and various lenses, and my secondary camera – a Canon EOS Rebel T3i with 50 mm prime lens. The weight was significant, and would be a good test of the strap. I had no problems sliding the camera into position for any type of shot I wanted to take. Carrying the cameras around for over 2 hours, I barely noticed the weight of the cameras. The strap is that comfortable. While initially concerned that the free-hanging cameras would bang against my leg or the surrounding environment, it was easy to adjust their position and prevent this from happening. If you’re someone who uses telephoto lenses of 200mm or more, you’ll want to be a little more careful in cramped environments. The other issue I encountered was minor: getting the split ring on the lug of my camera and mounting the screw to the camera. It took some finesse with my large hands to get the split ring on the lug. Now that it’s there, I may never take it off. I occasionally do shots low to the ground and found it easier to remove the camera from the strap. This took a little time if you’re someone who finds themselves doing this often. Overall, I was very impressed with the ease of use and comfort of this strap, and found it very useful for the run-and-gun type of shooting that defined this wedding reception. Matt uses a chromium salt tanning process to give the bison leather its softness and texture, and then a vegetable-based re-tan to bring back the form of the leather. The cream leather padding on the underside of the strap adds to the comfort and the beauty of the strap. The bridle leather strap is an English bridle that is vegetable-tanned, drum dyed, and stuffed full of waxes and grease to make it weather proof. While initially stiff, it has the advantage of molding to the user after repeated use. The hardware on both is beautiful and heavy duty at the same time. Large buckles and D-rings give these straps a flare that will make them get noticed. While the functions remain the same, the strap you choose is purely a matter of looks and what you prefer. At the price point of $215 for the tan bridle leather strap and $400 for the American bison mahogany strap, the Money Maker Luxury Leather Multi-Camera Strap is a great investment. Like all quality leather products, it isn’t inexpensive; it is an investment. Having not known about this product before I was asked to review it, I didn’t know what I was missing. I’ll be able to save my shoulders years of wear and look good while doing it. As of this final writing, I also had the opportunity to use this strap at an 8-hour wedding shoot on September 19th, 2015. With my 5D Mark III, battery grip, 70-200mm lens, and attached speedlight, I had some serious weight riding on my shoulders. In addition, I had my second camera, a Canon T3i with 50mmm lense as my backup, riding on the other strap. At the end of the day, my shoulders felt great – the strap performed that well. Now if only Matt could invent something to make my feet a little less tired. If you want a camera support system designed and built by a seasoned photographer that is attractive and functional, Hold Fast Gear has got it right. With twelve models, there is plenty to choose from when trying to satisfy your sense of adventure.